The Adjutant General’s Department synchronizes multi-agency assets utilizing integrated planning; coordinates local, state, and federal resources; and provides equipped, trained and ready Army and Air Forces, rapid emergency management response, and cohesive homeland security capability to protect life and property in our state, and protect national interests from both Kansas and abroad. Strategic Plan for Fiscal years 2019-2024. Command Chief Master Sgt. James Brown (left) hands chevrons to an Armenian soldier during a Partnership for Peace visit. 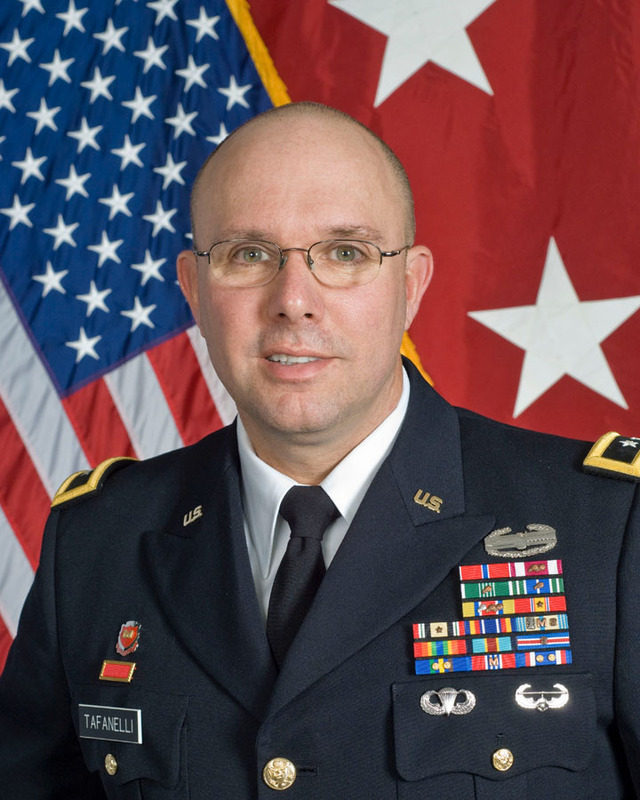 Brown has accepted the full-time position as the state command chief master sergeant. Participants in a Kansas National Guard Community Connect event strap themselves into a UH-60 Black Hawk helicopter in preparation for an orientation flight around the Lawrence area. 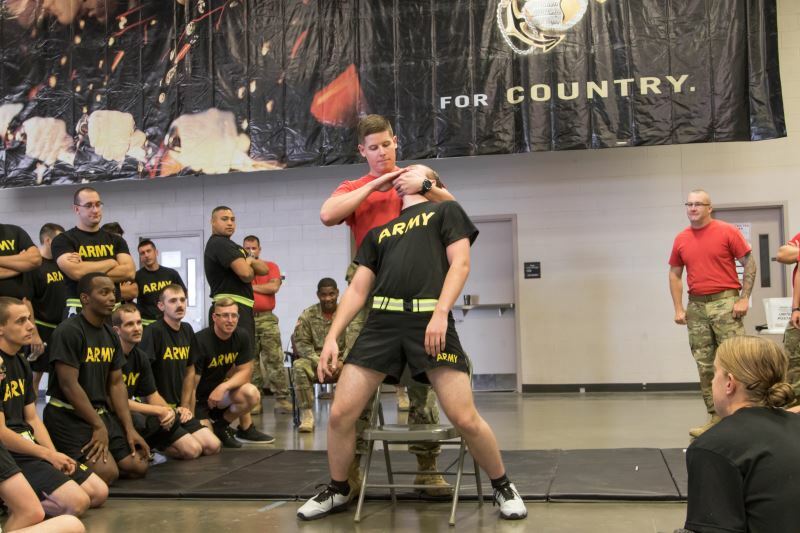 Soldiers of the 35th Military Police Company receive instruction in pressure-point crowd control measures during a training class Sept. 22. "Be prepared" was the message to the public during Preparedness Day at the Kansas State Fair Sept. 10. Local,state and federal emergency organizations were on hand to meetthe public and give them information on what they can do to be prepared for a disaster. Gov. Jeff Colyer MD signs a proclamation Aug. 24 designating September as Emergency Preparedness Month in Kansas. 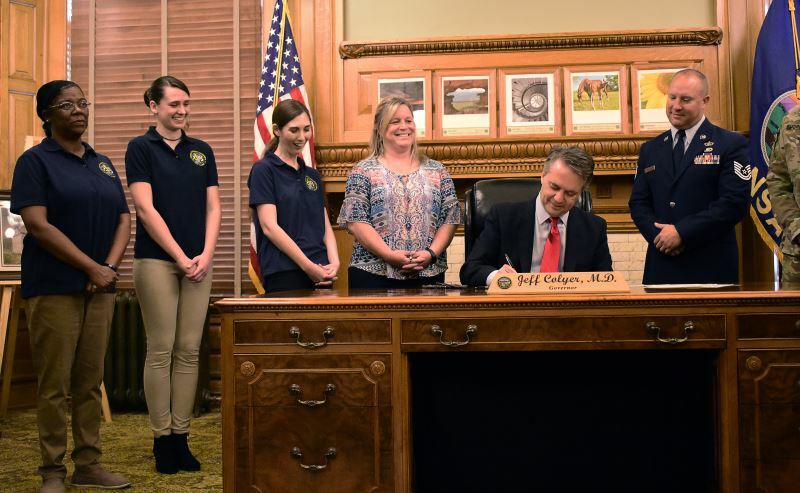 The signing was witnessed by staff members from the Kansas Division of Emergency Management and representatives of several emergency response organizations. State employees of the Adjutant General's Department are treated to a lunch served by Maj. Gen. Lee Tafanelli, the adjutant general, and members of his staff. The Employee recognition lunch and awards presentation ceremony took place Aug. 22 at the Museum of the Kansas National Guard in Topeka. Thank you for visiting our website. I am very proud of the many accomplishments of our Adjutant General's Department members. They are dedicated to protecting the lives and property of Kansans under the command of Governor Laura Kelly and defending our nation when the President calls. I hope you find our website helpful and informative.